Freddie Highmore might not want to quit his day job. The Good Doctor star has proven himself to be a talented thespian, both in the ABC medical drama and in projects like like Bates Motel and Finding Neverland. But his artistic skills are really put to the test in the April 27 premiere of Comedy Central's new late-night game show, Taskmaster. 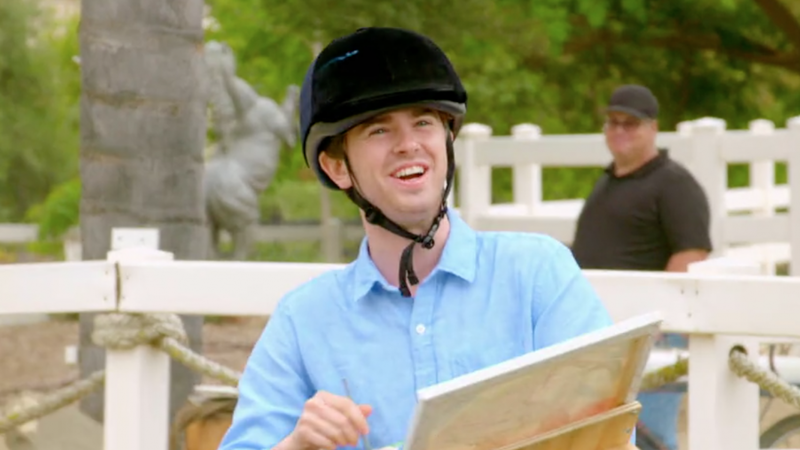 In an exclusive clip, we learn that Highmore's gift doesn't really extend to the visual arts, as he is asked by hosts Reggie Watts and Alex Horne to paint a horse while riding one. That might sound particularly difficult, but the 26-year-old actually has an advantage over the other contestants — he's in a buggy, not on horseback! And that's not all that happens in Friday's premiere! Be sure to tune in for the new show, which is based on an English series asking competitors to use their creativity to complete in unusual challenges. Other stars stopping by this season include Kate Berlant (High Maintenance, Search Party), Dillon Francis (DJ, Record Producer), Lisa Lampanelli (stand-up and insult comic), and Ron Funches (Trolls, Undateable).